Follow up to research or other activities on Easter Island History and The Lorax. 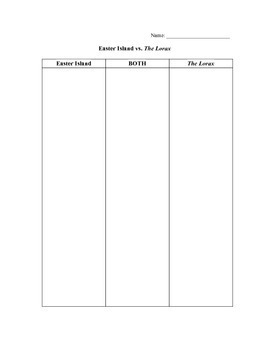 Teachers can use this chart as part of a Think-Pair-Share activity where students are each given a worksheet of the chart and are asked to compare and contrast Easter Island History and The Lorax. Then, students pair with a partner or group and add/correct the chart. Finally, The class joins together to create a cumulative chart that can be used as a basis for a unit assessment.